Tunisian President Beji Caid Essebsi told Egypt's foreign minister Sameh Shoukry on Wednesday that “Egypt is in safe hands” under the government of President Abdel-Fattah El-Sisi. Shoukry discussed with the Tunisian president bilateral relations between Egypt and Tunisia as well as the situation in war-torn neighbouring Libya. Essebsi affirmed that Egypt's army has played a pivotal role in preserving the country's institutions at a critical time. Abu Zeid said that Shoukry expressed gratitude and appreciation to Essebsi, and conveyed the Egyptian president’s wish for more cooperation and coordination between the two countries in facing regional challenges, particularly in the fight against terrorism and on the Libyan civil conflict. Shoukry also updated the Tunisian president on the outcomes of the annual meeting of the Tunisian-Egyptian Political Consultative Commission, which was held on Tuesday in Tunis and attended by Shoukry and his Tunisian counterpart Khemaies Jhinaoui. The two foreign ministers agreed to periodically hold high-level meetings to discuss bilateral issues, and discussed plans for Tunisia to host the foreign ministers of Egypt, Tunisia, and Algeria to prepare for a trilateral summit on Libya. Shoukry headed the Egyptian delegation at the 13th session of the Tunisian-Egyptian Political Consultative Commission. Tunisian foreign minister Jhinaoui the praised strong historical relations binding Tunisia and Egypt in various fields, expressing his country's hope for a visit by President El-Sisi at the earliest opportunity. 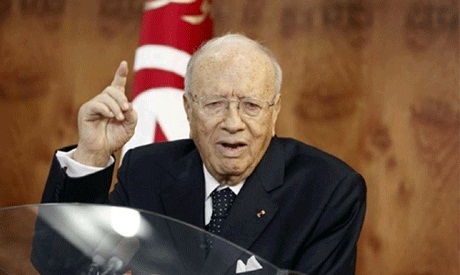 In 2015, Essebsi was the first Tunisian leader to visit Egypt in 50 years.